Good morning! Happy Wednesday to you all. I pray your week is going well thus far. Many times as believers, we wrestle with our identify and sense of belonging. We accept Christ as our personal savior, but we still identify ourselves with certain aspects of the world. We know we are different, but sometimes we try to convince our “worldly” friends that we haven’t changed. On the contrary, the closer you grow to Christ the further apart you are from the world. You better recognize-you are now enemies with the world. You better recognize-you are different. You better recognize-people in the world will not understand the things of the spirit. You better recognize-people will not receive your message. You better recognize, it’s time we all recognize! Here Jesus was made flesh in order to dwell among us and the very people who were created by Him didn’t even recognize Him. Jesus walked up to people who should have known Him and was not received and even in some cases denied by His disciples. When you begin walking in the ways of the Lord some of your closest friends won’t recognize you anymore. People who use to roll in your closet circles will begin distancing themselves from you. Don’t take it personal, just recognize you are changing. Recognize that you are a spiritual being living IN the world, but you are not OF the world. The sooner you accept that you are a new creature in Christ the easier it will become to accept your calling; your purpose. You better recognize-everyone can’t go where God is calling you. You better recognize-you can’t save anyone, but you can lead them to the One who can save. You better recognize-you can’t be everyone’s friend. You better recognize-you will have to walk alone sometimes. You better recognize-you are a light in a dark world and you can’t serve two masters. You better recognize-you are a child of God and should conduct yourself as such. It’s time for all believers to stop trying to cater to the world and to the spirit. It’s time to die to flesh daily and realize that where God is calling you everyone won’t understand or receive your message. Your mission is to spread the message of Jesus Christ through whatever means He gives you to do so. You better recognize you will encounter rejection, but God is still God. You better recognize you will cry sometimes, but Jesus still sits on the Throne. You better recognize your calling and begin walking in your purpose driven life. It’s time recognize who we are in Christ. Good afternoon! Happy Monday to you all! I pray everyone had a blessed weekend! This weekend I spent some much-needed time listening to God. Sometimes we can encounter so much clutter in our thoughts that we begin to move off course. It’s important to know, the loudest voice in your ear will become the voice you listen to the most. I needed to turn down the volume on the world and turn up the microphone for the Lord because my thoughts were becoming filled with distractions. During my quiet time with the Lord, He spoke to me about sabotage; self sabotage to be more specific. Sabotage is defined as any underhand interference with production, work, etc. Typically the enemy tries to sabotage your plans or jealous people, family members, or shady co-workers and the list goes on. However, self sabotage is when you are the enemy to yourself and you come against your plans to reach your goals and dreams. Sounds crazy right? Why would you want to sabotage yourself? Why would I want to sabotage myself? It doesn’t seem right, but it happens all of the time. How many times has God given you an assignment and you are all excited and well on your way to reach your goals then all of sudden fear, complacency, doubt, and anxiety sneak into your mind? Self sabotage has a way of rearing its ugly head in the forms of procrastination, mediocrity, becoming too comfortable, laziness, negative self-talk, uncertainty and the list goes on. A person set a weight loss goal and is only 5-10lbs away from goal and says, “I guess this is the weight I am supposed to be.” SELF SABOTAGE! A person who only has a few more credit hours to complete until graduation and says, “This is too hard, maybe I should take a break.” SELF SABOTAGE! A person who has been searching for a new job and has constantly received rejection letters says, “I guess I’m stuck here” and then they stop applying for jobs. SELF SABOTAGE! A person who desires to go back to school, but doesn’t have all of the money decides they won’t even apply to school. SELF SABOTAGE! These are just a few examples of self sabotage, but I know you can think of many more examples. If God gave you the vision, He will make the provision. There is power in the tongue and you have to speak life into your situation. You have to fight daily to maintain a positive spirit. If you believe in what God has promised you then I challenge you to stand on His word! It doesn’t matter what it looks like in the natural. Trust and believe God is working things out in the spiritual. Don’t give up and don’t give in. We (I am speaking to the choir on this one) have to trust in God and remain confident that if He started something in us, He is faithful to complete it. If God gave you a goal weight to reach then don’t give up just because it gets tough. Don’t go back to the old habits you fought so hard to get rid of. If you are almost finished school then keep pushing. Don’t get discourage because the course load is tougher, you are almost there keep pressing. If you are looking for a new job and you know there is a better position out there for you, don’t get discouraged get hyped up because rejection means you are getting closer to acceptance. If you have a desire to go back to school then fill out those college applications. Step out on faith and trust in the Lord! STOP the SELF SABOTAGE! Speak life into your situation and stop killing the vision with your words and lack of action. Stand on the promises of God. Pray often and Trust in the Lord! Good morning! Happy Friday to you all! 8 “The Lord will command the blessing on you in your storehouses and in all to which you set your hand, and He will bless you in the land which the Lord your God is giving you. Today my husband and I are celebrating our fifth anniversary. I am in awe by the grace of God that has covered our marriage. I have a new understanding and appreciation for the phrase, “God’s grace is sufficient.” God’s grace is defined as undeserved favor and I’m a living testimony that the love I receive from my husband is a piece of the undeserved favor God has blessed me with. I attribute the blessings that I encounter in life to my obedience to God’s word. Now don’t take my word for it, instead search the scriptures and see what God says about being obedient to His commands. When you obey the word of God you will be set high above the nations of the earth. I don’t know about you, but I want to go higher in Christ. The blessings that you receive from God should be evidence of your obedience to Him. If you are always suffering and always going through and claim to never have any good days then I would venture out to say you are not obedient to God. I know I may have stepped on someone’s toes, but if the shoe fits wear it and if you don’t like it take that shoe off and put on a new pair. Yes, the Lord reigns on the just and the unjust, but if you have more bad days than good days, I would highly suggest you check your spiritual walk. I don’t know about you, but I want to be used by God. I want to serve Him and shine His light to the world. I want people to see the evidence of Christ in my walk. I want people to desire to come to Christ. I want to live a life that is pleasing to God and one day I want to hear, “Well done!! !” The blessings of God, the grace of God, the unmerited favor of God is available to everyone who follow Him. There are blessings attached to your obedience. Are you being obedient to God in your walk? I wish you all a Happy Friday! Have a blessed day and a safe weekend! Good morning. Happy hump-day to you all! I pray all is well in your neck of the woods. 4 For though He was crucified in weakness, yet He lives by the power of God. For we also are weak in Him, but we shall live with Him by the power of God toward you. Okay folks, I have a confession, I am sick and tired of people saying, “The devil made me do it” or “I’m only human” or any variation of the saying that shifts the blame from self onto someone else. Excuse my English, but the DEVIL AIN’T GOT NO POWER! How can you claim to be a child of God and yet in the same breath you give the devil power to make you do something against your will? The only thing the devil can do is entice your fleshly desires, but he can’t make you do anything. The scriptures referenced above, show us that there is nothing that will tempt us that we are unable to resist. God always provides a way of escape. The problem is many times we overlook the escape latch on the door or window and run right into sin in an effort to please our flesh. The scripture also shows us that in our weakness we are strong by the power of God. I encourage you to search the scriptures on how powerful God is and how powerful Christ is in you. When the devil tempts you with a certain person, thing or habit and you allow your weak flesh to cave in and sin, then he continues tempting you with the same things because he knows you are demonstrating a consistent level of weakness. Eventually the enemy takes up residency at your home, job, school, church, etc. because he knows he has got you. The devil doesn’t have any new tricks. He just continues recycling the same old temptations waiting for you to stumble and fall. The way to combat temptation is to stay prayed up and consistently study and learn God’s word. You have to dedicate time to daily devotions. It’s important to go to church for bible study and Sunday morning worship. If you don’t tap into the power that resides in you then you will continue to fall to sin. Stop saying, “The devil made me do it!” and start walking in the power of God! Distractions are defined as mental distress or derangement, which divides your attention, or prevents your concentration. Distractions can come in all shapes and sizes. It can be a person, place or thing. Your attitude concerning life can be a distraction. Social media, friends, family, economic status, and even the church can become a distraction. Any thing or any person that causes your attention to become shifted from pursuing your goals and dreams can be deemed a distraction. I am guilty of becoming distracted at times and unable to concentrate on the task before me. Sometimes valuable time is lost and cannot be replaced. In instances like these, I want to warn you against allowing your feelings of failure or complacency to cause you to become even more distracted. Sometimes we can spend so much time complaining about something that went wrong that we end up losing more time. The devil does not want you to accomplish your goals and dreams. I repeat, the devil does not want you to accomplish your goals and your dreams. It is his mission to deter you from the plans that God has for your life. The scripture tells us in Jeremiah 29:11 that God has a plan for your life. He wants you to have a prosperous life and you can’t get there if you allow distractions to consume you. Did you now that the enemy also knows that God has a plan for your life and he will not rest until he puts a monkey wrench in those plans? It’s important to combat the things and people who try to cause you mental distress. Don’t allow distractions to take you off of your focus. Assignment: Take a moment to review the vision God has placed before you. Write all of the “plans” that God has given you down. Once you have done that, jot down what you are doing to work towards reaching those goals and dreams? Are you still working on those things? By chance, did you stop working towards reaching those goals and dreams? If you have stopped can you pinpoint what the distraction is or has been? 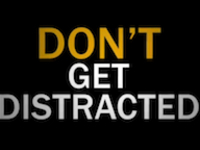 We will all get distracted from time-to-time, but I urge you not to stay distracted long! The vision God has given you has been on hold long enough, it’s time to dust your ideas off and get to work. I pray that you decide to take your goals and dreams back and get busy moving forward. Pray for me as I journey on to greater! Good afternoon! God is so good. I am in such a happy place this week. God is truly doing amazing things in the lives of others. 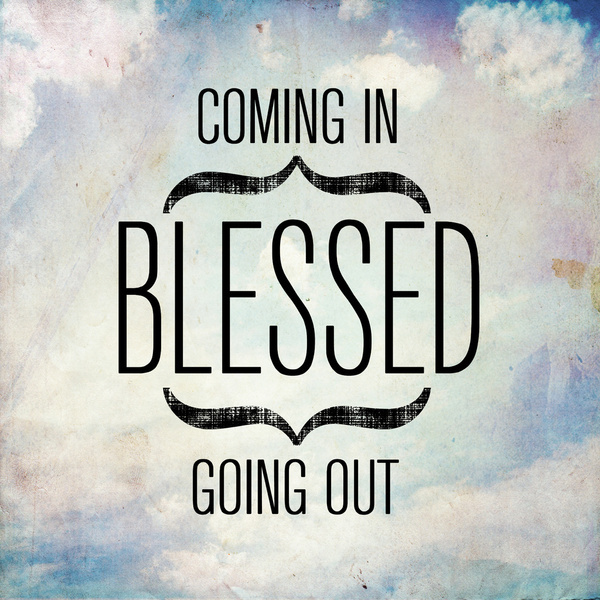 I have received great news from friends about how God is moving in their life and I’m overjoyed! It’s a beautiful thing to see God blessing others. Thank you Lord for manifesting your blessings in a mighty way! I praise you for being Sovereign! 5 And seeing the multitudes, He went up on a mountain, and when He was seated His disciples came to Him. 2 Then He opened His mouth and taught them, saying: 3 “Blessed are the poor in spirit, For theirs is the kingdom of heaven. 4 Blessed are those who mourn, For they shall be comforted. 5 Blessed are the meek, For they shall inherit the earth. 6 Blessed are those who hunger and thirst for righteousness, For they shall be filled. 7 Blessed are the merciful, For they shall obtain mercy. 8 Blessed are the pure in heart, For they shall see God. 9 Blessed are the peacemakers, For they shall be called sons of God. 10 Blessed are those who are persecuted for righteousness’ sake, For theirs is the kingdom of heaven.11 “Blessed are you when they revile and persecute you, and say all kinds of evil against you falsely for My sake. 12 Rejoice and be exceedingly glad, for great is your reward in heaven, for so they persecuted the prophets who were before you. Get ready for a supernatural shift! Yes, when you dedicate your life to serving God you will experience a level of blessings and favor that far exceed anything you have experienced in your life. The ultimate blessing is that God promises believers the kingdom of heaven. That is something to rejoice about daily. We have to remember that we are spiritual beings living in a natural world and this place is temporary. We are members of a royal priesthood and have something far greater on the other side. Even though our ultimate reward is in heaven, we still have the joy of knowing that God will take care of us while we are on this earth. It is time for believers to prepare for the supernatural shift that will take place in your life and the lives of others. God has seen you struggling and will honor your faithfulness. God sees your dedication to reading and studying the word, He hears your consistent prayers, He sees your service in ministry, He sees how you give of your time, talent, and tithe and He has not forgotten you. I don’t know exactly what you are going through, but I do know that if you continue to serve God you will experience a supernatural shift. This shift will not make sense to man and it will even blow your mind, but get ready! It’s my opinion that God will take your current situation in the natural and place His supernatural power, authority, grace and mercy all over it and cause the atmosphere to shift on your behalf. That spouse you have been praying for will show up when you least expect it, matter of fact, they may have been staring you in the face the entire time. That job that you don’t qualify for on paper, will turn around and you will become the top candidate. That school tuition that you didn’t think you could afford, will be paid in full. That baby that you and your spouse has longed for will manifest in the womb. That ministry that you desired to start will not only be planted, but it will bust through the walls of the church and reach the nations. Oh, when God gets ready to move it will be like a supernatural tsunami; long before you can see or feel the effects of the earth moving, God will begin pouring out a blessings that you wouldn’t have room enough to receive. Why, because God is faithful to those who are faithful to Him. I encourage you to continue walking in the ways of the Lord. Be mindful of the “Be attitudes.” God wants to shift some things in your life and He just wants you to stay on course. Trust Him. Follow Him. Serve Him. It’s not to late to serve God. Choose Him today! The shift that takes place in your life will affect your children. I don’t know about you, but I want to be blessed and I want my children to be blessed. I want to experience this supernatural shift and I am dedicated to following Christ, how about you? I pray God’s blessings over your life. Get ready for the shift! Good afternoon! I pray your week is going well thus far. 17 “Ah, Sovereign Lord, you have made the heavens and the earth by your great power and outstretched arm. Nothing is too hard for you. Every since I was child, I have always been ambitious. I’ve always desired to do great things and never gave the size of a task a second thought. I just knew what I wanted and I knew I could achieve it. I use to dream about things until I was able to put my plans into action. As an adult, not much has changed. I’m still dreaming bigger than my physical capabilities, but now I have an increased faith in who resides within me. Jesus lives in me and that makes me powerful. I constantly post on my Facebook page, “Greater is Coming!” This statement is not a catch phrase or something to do for fun, rather it’s a daily declaration of the promises God has made to me. Greater is truly on its way and I will continue shouting them from the mountain top, trusting that God will meet me there and exceed my desires. Today, I want to encourage someone reading this to reach for your goals! I mean really reach for them. God has given you a vision years ago and you have sat on it because of fear, doubt, lack of finances, lack of motivation, lack of knowledge, and the list goes on. I am here to tell you, if God gave you the vision, He will make the provision. You have to reach for your goals. It’s not enough to say, “Lord, I want to do this or become that”, you have to show God you believe He will provide by putting that plan into action. You have to step out on faith and be willing to take chances. There is a sweet level of satisfaction when you begin walking in your purpose and begin experiencing the manifestation of God’s promises over your life. That type of fulfillment doesn’t come from having a dream and then allowing it to die. It comes from reaching for your goals and obtaining them. Will you REACH FOR YOUR GOALS! I love how Jeremiah 32:17 reads, it reminds me of how powerful God is and that nothing is too hard for Him. I encourage you to put your goals and dreams in Gods hand. Pray over them, believe in them, speak them, and then get to work. Don’t let greatness die within you because you are scared to take a chance. Don’t allow naysayers to keep you from reaching past mediocrity into greatness. It’s time to reach for your goals and you can start today! 17 The righteous cry out, and the Lord hears them; he delivers them from all their troubles. 18 The Lord is close to the brokenhearted and saves those who are crushed in spirit. 19 The righteous person may have many troubles, but the Lord delivers him from them all; 20 he protects all his bones, not one of them will be broken. Rejection is something you never really get use to. It leaves you feeling unwanted, discarded, pushed away, cast aside, shunned or thrown away. Rejection never leaves you with a good feeling. At least it never left me with a good feeling. Maybe you have been rejected by a loved one, or by a potential love interest, or for a job offer, or by a college of your choice. I would venture out to say that everyone has been rejected someway or another. We’ll today I have good news; rejection can be a blessing! I know some of you are reading this saying, “How can rejection be a blessing when it hurts and leaves you feeling lonely?” We’ll I’m so glad you asked. Sometimes you will face so much rejection that you will begin thinking something is wrong with you. It’s in that moment that God will remind you that something is wrong with you; you are His child and He has great things in store for you. God doesn’t want to give you any old thing. He wants to bless you with the best. It’s important to find the blessing in rejection. Sometimes man’s rejection is really God’s protection over your life, your mind, your heart and your well-being. That’s a blessing right there. God will allow man to reject you so that He can keep you from unnecessary harm. Look at the Psalm 34: 17-20 and you can see that the Lord hears you when you cry and although you will face troubles and rejection, God will never leave you. He actually stays close to you. He will also deliver you and protect you. I encourage you to find the blessing in everything even in rejection. Ask God what you can learn from the experience, how it make you stronger, what is it preparing you for, and what did it protect you from. Find a way to change your negative perspective and embrace rejection because down the line you will see the blessing in it. Good afternoon! I pray God’s blessings over your life and I hope you have a blessed and productive work week! Good morning! I hope you had a blessed 4th of July. God is truly a Wonder! I love how He loves me even when I don’t feel like I deserve it. Jesus Loves ME!!! That’s enough to praise Him for the rest of my life! Children of God, I am here to remind you that you serve a GREAT God! And since you serve a GREAT God you shouldn’t settle for less. We serve the creator of the heaven and the earth, the creator and the master of every animal on this land, One who is Mighty in Power and the giver of life. We serve an Amazing God with unlimited power to turn any situation around for His glory. Since you serve a Great God, stop settling for less! 10 For every beast of the forest is Mine, And the cattle on a thousand hills. God owns the cattle on a thousand hills, He even owns the hills. So you serve a wealthy God. When you accept Christ as your Lord and Savior, you have access to the kingdom of God. You are not a visitor, you are no longer a stranger, you are no longer an enemy; you are a descendant of the Father and have a right to the things of God. I know your flesh tells you that you don’t deserve more than what you qualify for, but as believers of Christ we have privileges beyond what the world can give us. Greater is HE who is in YOU-God is Great and He lives within you and that makes you great! Don’t settle for less! Don’t settle for relationships that don’t bring value to your life. Don’t settle for positions that undermine your experience and qualifications. Don’t settle for friendships that are more draining than uplifting. Don’t settle for mediocrity when you are destined for greatness. Don’t settle for the doctor’s grim report when the Master Physician has the final report. Don’t settle for labels that the world tries to place on you. You are a child of God and the Lord has a plan for your life. Don’t settle for less when you are blessed by the best! Walk in your calling and know whose you are!